It’s Epcot Food and Wine Festival Time. 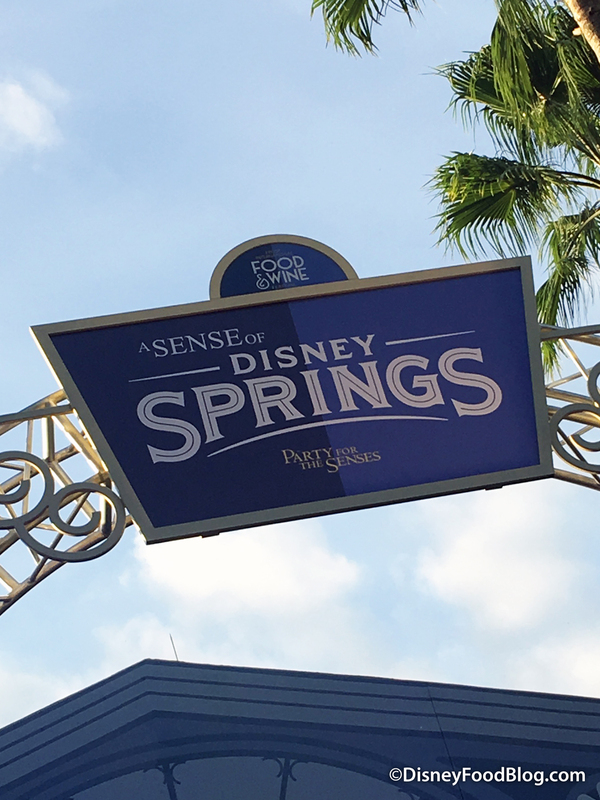 And that means we’re heading back into World ShowPlace for the grandest of the Food and Wine Festival Special Events — Party for the Senses! In previous years, Party for the Senses one of the festival’s biggest (and priciest) Special Events, brought together over-the-top food and drink, paired with up close and personal entertainment provided by Cirque de Soleil. But in 2016, that all changed, as the events became much more specifically themed and the slate of entertainment changed with each party. 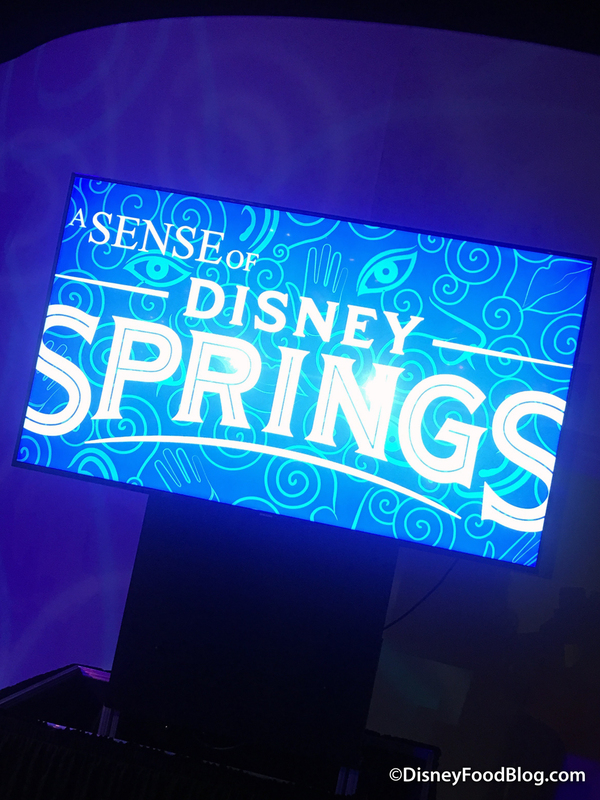 Join us as we look back at one of the events from last year, which celebrated Disney Springs. Have you ever been inside the cavernous World ShowPlace? What? You don’t even know what that is? Well, that’s because it’s a special events pavilion that’s only opened up for big doings, such as holiday dinner buffets… and grand tasting events during the Epcot Food and Wine Festival, like Party for the Senses. 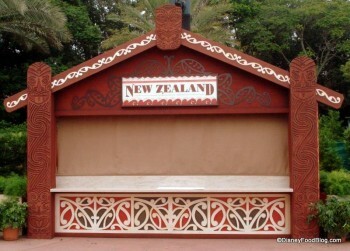 During the rest of the year, the venue, located between the Canada and UK Pavilions, is hidden behind a large set of wooden doors. News! 2017 Epcot Food and Wine Festival BOOTH MENUS, FOOD PHOTOS, and SPECIAL EVENTS Details! Woohoo! It’s finally here! We have a WHOLE LOTTA INFO TO SHARE WITH YOU TODAY! That’s right — today we are sharing NEARLY ALL of the information that you need to plan your 2017 Epcot Food and Wine Festival visit! See the 2017 Epcot Food and Wine Festival Menus and Start Planning! Be sure to click on our individual pages for each booth to see food photos of most of the dishes! The festival runs from August 31 through November 13. That’s 75 full days of eating and drinking All the Things Around the World! And general booking for ALL EVENTS begins on Thursday, July 20! We know that you’re anxious to get planning, so let’s get right to it — here is all the information on everything happening at this year’s Food and Wine Festival! Once again, the fun is officially expanding into Future World, as Marketplace Booths will once again be located in this part of the park. Enjoy 35 different booths in all to celebrate 35 years of Epcot! 2017 Epcot Food and Wine Festival Tip: How Many Days Should I Budget For the Festival? You Guys! It’ll be here before we know it!! YEP — I’m talking about the 2017 Epcot Food and Wine Festival! If you haven’t already, mark your calendars for August 31-November 13. This year’s festival offers a record 75 days of fantastic eats, drinks, and more! Already, we’re starting to get our very first big pieces of news about how this year’s festival will shape up. We know for sure that there will be 35 booths to celebrate the 35 years of Epcot, and that both India and Spain will return in 2017. While we await the announcement of the rest of the new booths, we can still start our planning! If you haven’t already done it, this is a great time to preorder the 2017 DFB Guide to the Epcot Food and Wine Festival. We have all the tips, tricks, and strategies that will make this your best fest yet! AND when you preorder the 2017 guide, you get the 2016 guide for free as an immediate download — so you can start your planning now! How Many Days Should I Budge For The Epcot Food and Wine Festival? We get this one all the time! And while there’s no right or wrong answer, we definitely have a few things for you to consider as you make your decision. We’ve finally made it! 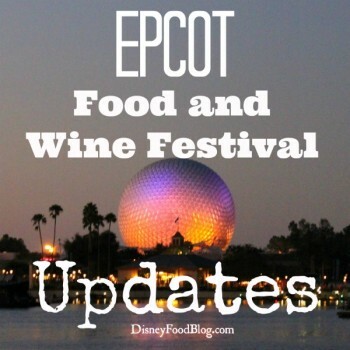 The 2015 Epcot Food and Wine Festival is opening next week! Soon, it will be time to Dine Our Way Around the World, as the World Marketplace Booths begin serving dishes inspired by flavors throughout the world! And with more than seven full weeks of Special Events, Culinary Demos, Beverage and Mixology Seminars, and special exhibits, this event is a food lover’s paradise. While we anxiously count down these last few days until all the fun starts, we’re taking a look at some of the events we enjoyed from last year. 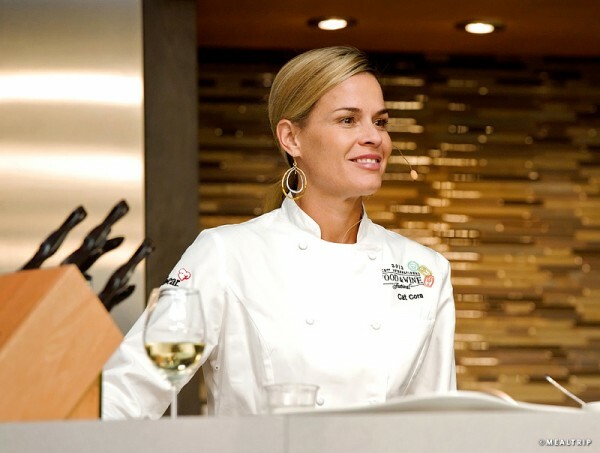 In 2014, one of the Special Events was Food for Thought, an event where celebrity chefs shared favorite recipes while sharing their personal stories. 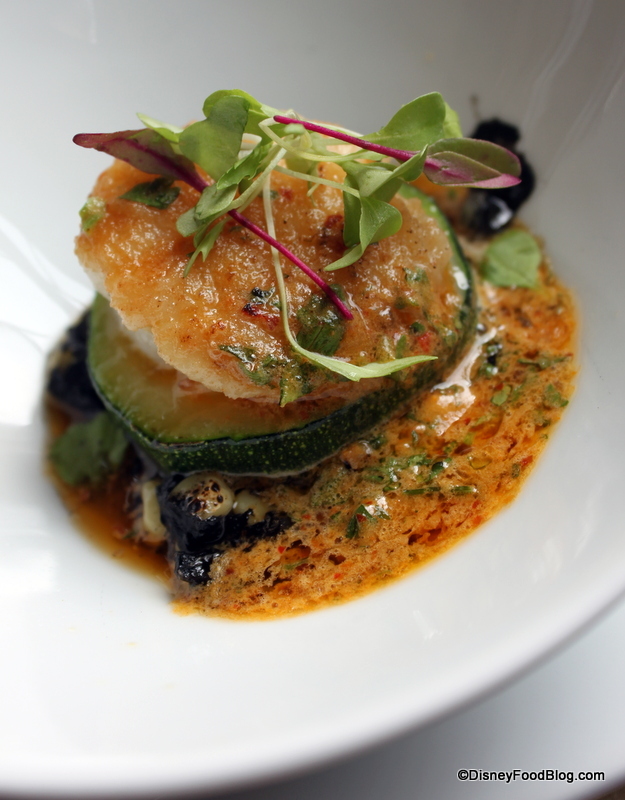 (Read our review of the event featuring Chef Rick Bayless last year here.) 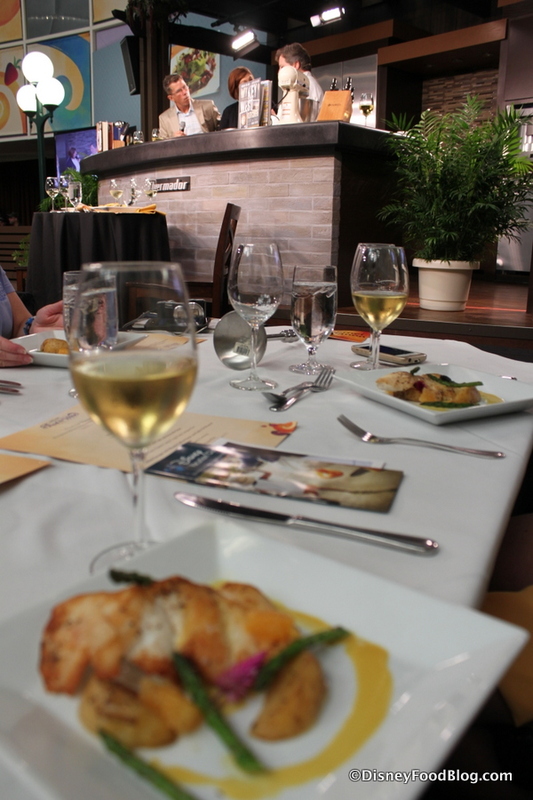 During these events, guests also enjoyed three dishes from one of the featured chef’s cookbooks. In 2015, you’ll find a similar event called “What’s Cooking With”. I had the pleasure of attending one of these events last year, and I learned some great tips and techniques from Florida-local Chef Norman Van Aken. Let’s check out some of the delicious dishes we enjoyed. I arrived at Festival Center for this event a few minutes early. It actually took place during brunch hours. The Festival Stage was decked out as usual. Located at the back of the Festival Center, this is where all festival Culinary Demonstrations as well as many Special Events take place. We are ramping up for another fantastic Epcot Food and Wine Festival! 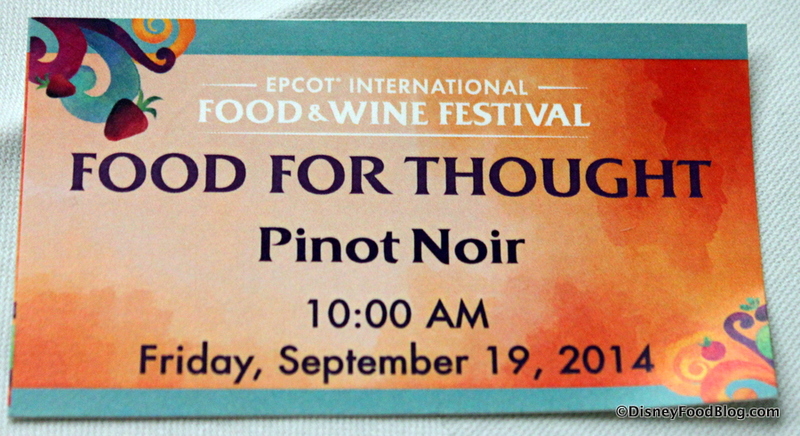 Today, we’re reviewing a fun Special Event from the 2013 Epcot Food and Wine Festival. We are heading over to Tokyo Dining in the Japan Pavilion for the Food and Beverage Pairing experience. The light meals feature beverages paired with tasting-sized portions of the restaurant’s cuisine. 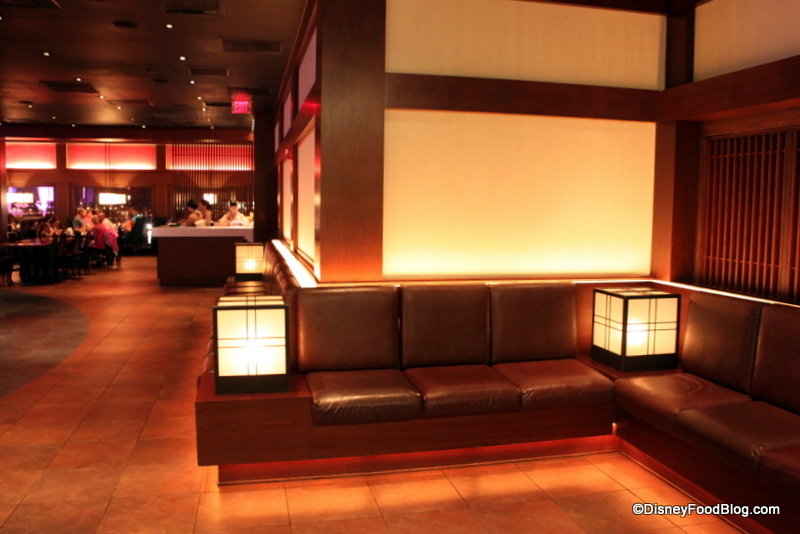 I’ve enjoyed dinner at Tokyo Dining as well as lots of fun meals at Teppan Edo, so I was pretty sure I was in for a treat! While we’d done the Morocco food and beverage pairing event, we’d not yet experienced the Japan version. Here we go! When I arrived for the Food and Beverage Pairing, I checked in at the stand that serves both Teppan Edo and Tokyo Dining. 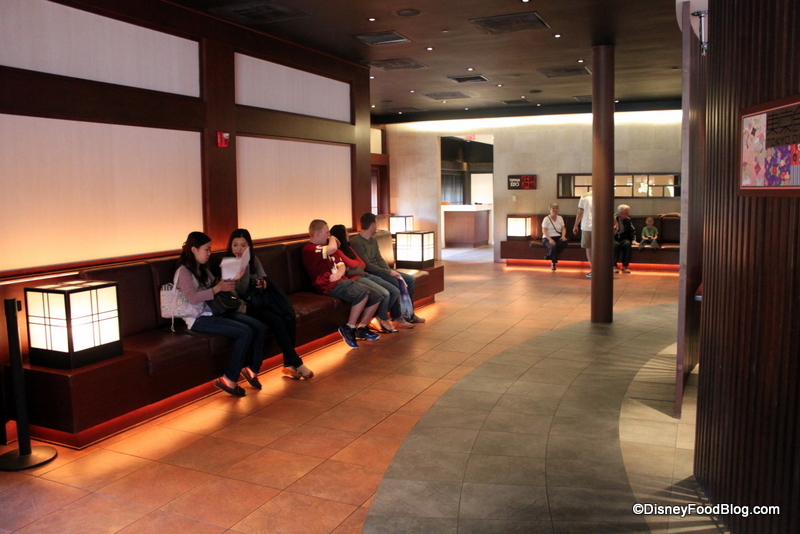 The cool, sleek waiting area features simple, modern decor and comfortable low lighting. 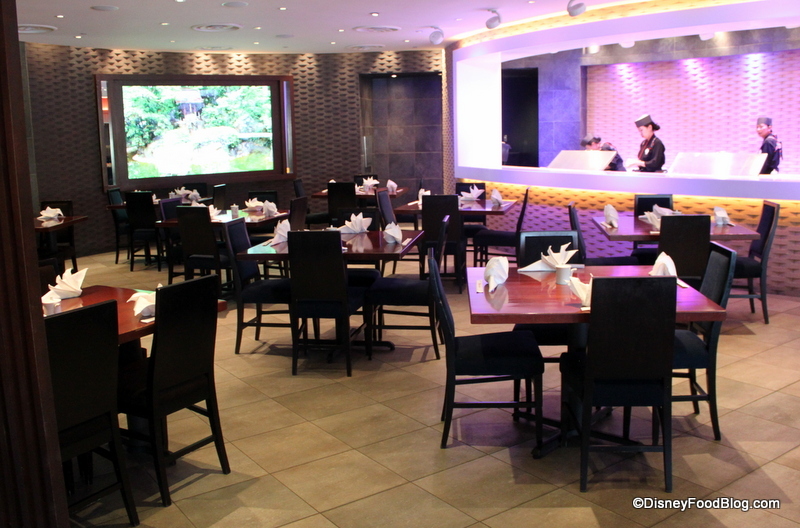 This area is also shared by the two restaurants. Step into the Tokyo Dining seating area, and the same modern Japanese vibe is prevalent throughout. A sushi show kitchen takes up space along one wall. 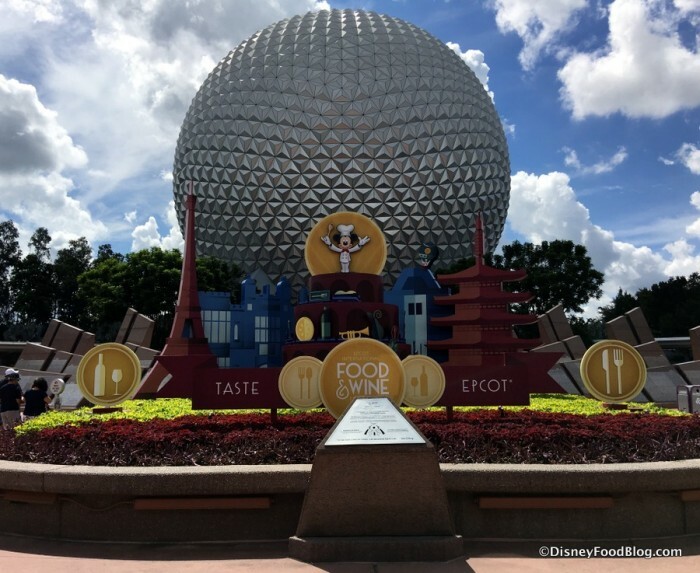 I had the wonderful opportunity of attending the Epcot Food and Wine Festival preview yesterday evening at Walt Disney World’s Epcot, and I have more new information to share about the 2013 Epcot Food and Wine Festival! 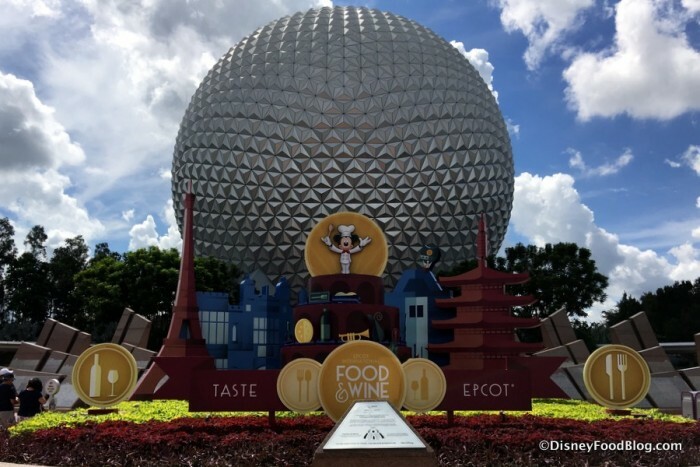 As always, you can visit our Epcot Food and Wine Festival index page for ALL updates at any time. 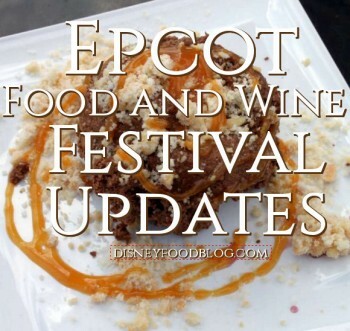 We’ve got ALL THE CONFIRMED 2013 EPCOT FOOD AND WINE FESTIVAL BOOTHS for you today!! Be sure to check out our 2013 Epcot Food and Wine Festival Booth Page for updated menus, food photos, and more as the Festival gets closer! The New Zealand Booth is back this year! Brazil < -- RETURNING AFTER HIATUS! Brewer’s Collection Canada Cheese China Craft Beers Desserts & Champagne Florida Local France Germany Greece Hawaii Hops & Barley Ireland Italy Japan Mexico Morocco/Mediterranean New Zealand Poland Refreshment Port <-- EXPANDED MENU! Scotland <-- NEW Singapore South Korea Terra Vegan Remember -- stay tuned to our 2013 Epcot Food and Wine Festival Menus and Booths page and our Disney Food Blog Newsletter for more details! We have also confirmed that a brand new dessert will be coming to the Australia Booth — a Pavlova with Fresh Driscoll’s Berries and Vanilla Custard. And a new kids’ dessert will pop up at the Desserts and Champagne Booth — a “frozen s’more” smoothie! News From the Epcot Food and Wine Festival Preview! We’ve got great news for Disney Dole Whip lovers!! Dole Whip Debuts at the Epcot Food and Wine Festival! 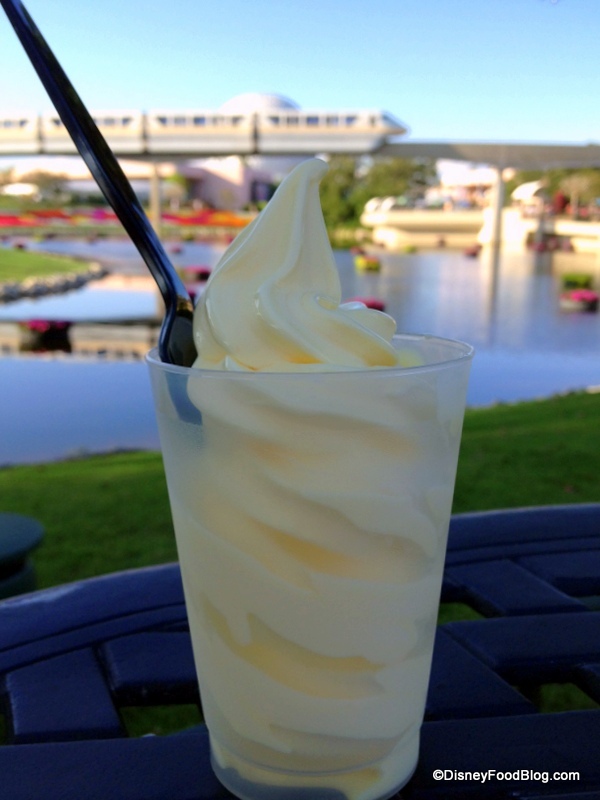 Dole Whip Is Coming to the 2013 Food and Wine Festival! That’s right! It was such a huge hit at the Flower and Garden Festival earlier this year that it’s back by popular demand. There’s one major change, though — this time around, the Dole Whip will be orange! And there are plans to serve with a liqueur once more. While the flavor profile isn’t finalized, I can tell you it’s going to be a very delicious addition to the enhanced Food and Wine Festival Menu at the Refreshment Port! Sneak Peek! 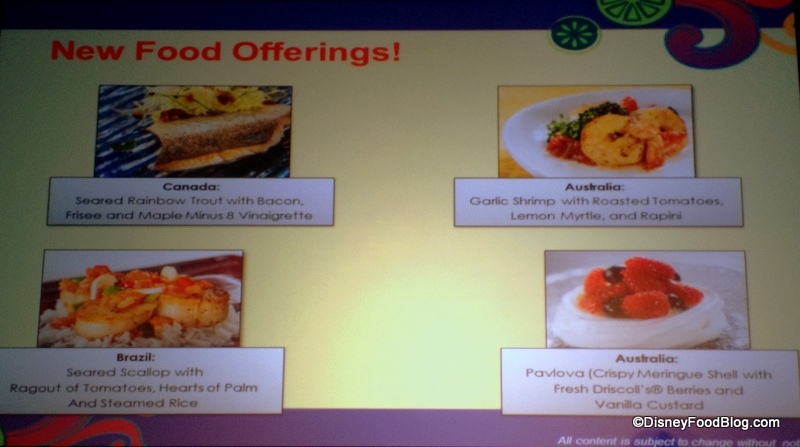 New Epcot Food and Wine Festival Menu Item PHOTOS! I did get the chance to try a couple of the new (and returning) items for this year! Take a look! Scotland Booth — NEW this year! The Scotland booth will be debuting at this year’s festival! Great news! We’ve got another few pieces of the 2013 Epcot Food and Wine Festival puzzle! And we now know that booking for Epcot Food and Wine Festival Special Events will begin on August 13th at 7am ET! Call 407/WDW-FEST (939-3378). The big news? 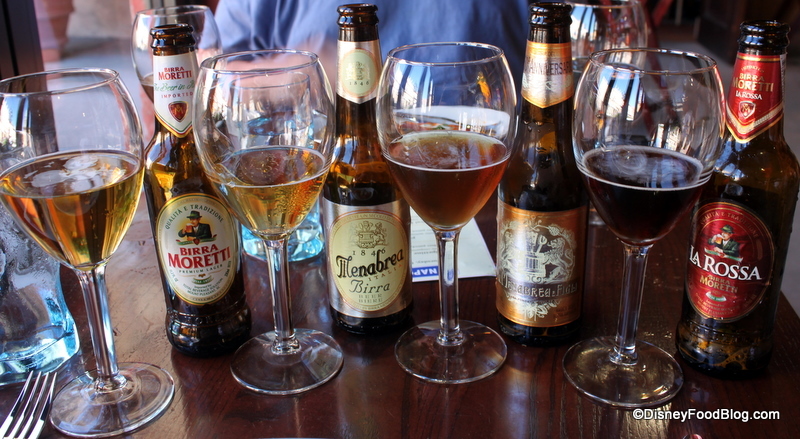 French Regional Lunches are coming back this year…and Italian Regional Lunches are continuing! We’ll also see a few new additions to the festival special events docket. Be sure to check out our 2013 Epcot Food and Wine Festival Special Events page for ALL of the details on these options; and check out our 2013 Epcot Food and Wine Festival page for all of the latest news and updates on this year’s festival. We’ll have more details for you about these events on our Epcot Food and Wine Festival Special Events Page as soon as they’re released! “3D” Disney’s Dessert Discovery (Oct. 4, 11 and 25), $55 or $90 (sweet seats) — See a review here! 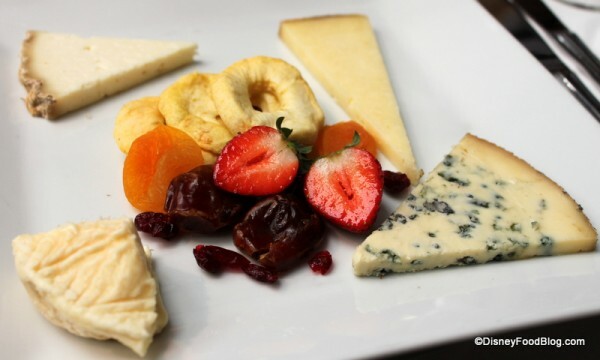 Cheese Seminars (Sept. 28, Oct. 5, 12, 19, 26, Nov. 2, 9), $80 — see a review here! Party for the Senses (Oct. 5, 12, 19, 26 and Nov. 2), $145, $180 or $285 — See a review here! Food & Beverage Pairings (Tuesdays, Thursdays), $55 — See a review here! French Regional Lunches (date and price TBD) — See a review here! Mexican Tequila Lunches (date and price TBD) — See a review here! There are plenty more where these came from! We’ll have more details for you about these events and MORE on our Epcot Food and Wine Festival Special Events Page as soon as they’re released! Don’t forget about our pick BEST VALUE of the festival — the Epcot Food and Wine Festival Low-Cost Seminars and Demonstrations! 2013 Epcot Food and Wine Festival Menus and FOOD PHOTOS: Coming Soon! 2012 Epcot Food & Wine Festival Marketplace Booth/Kiosk MENUS and FOOD PHOTOS <–UPDATED with all new photos from 2012! 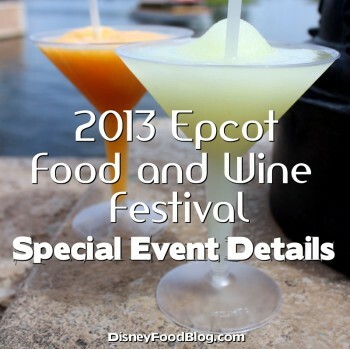 2013 Epcot Food & Wine Festival Low-Cost/Free Seminars and Activities: Coming Soon! News! The DFB Guide to the 2013 Epcot Food & Wine Festival e-Book is now available for pre-order! The best part? 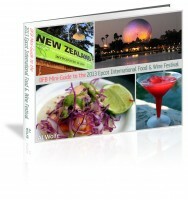 By pre-ordering, you automatically get our 2012 Food and Wine Festival Guide for FREE, instantly! That means you can start planning NOW for your trip! Use code prefoodwine at check-out for a $3 discount!